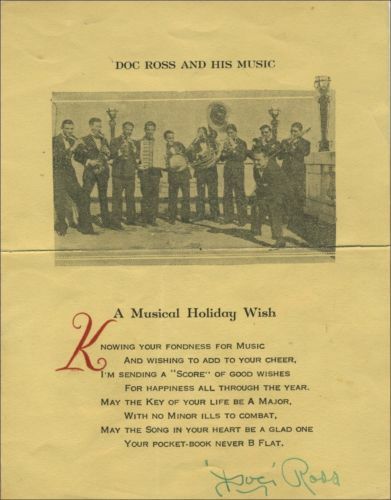 “KNOWING YOUR FONDNESS FOR MUSIC”: HOLIDAY WISHES FROM DOC ROSS and JACK TEAGARDEN! I wouldn’t mind getting this holiday card . . . ! Seasons Greetings and more — 1926 style! This entry was posted in "Thanks A Million", Irreplaceable, Jazz Titans, Swing You Cats!, The Things We Love and tagged Doc Ross, Ebay, holiday cards, Jack Teagarden, Jazz Lives, Michael Steinman, seasons greetings. Bookmark the permalink.